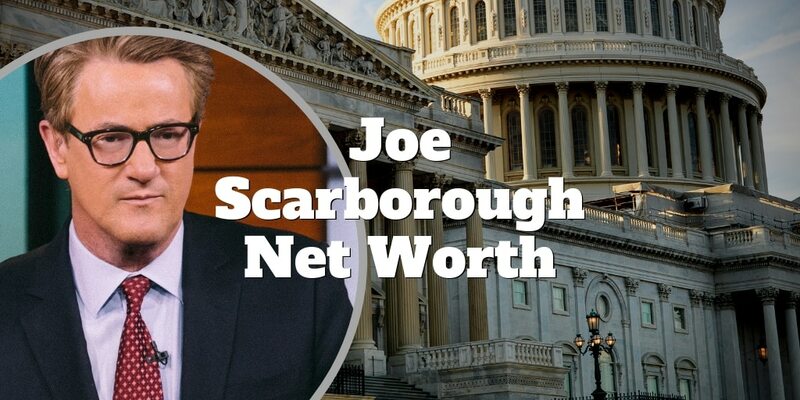 Home › Celebrity › Joe Scarborough Net Worth – Does He Really Make $8M? Joe Scarborough is a high-profile talk show host best known for MSNBC’s “Morning Joe.” He has served as a congressman and in various roles as a lawyer before entering the media. His success as a politician, author and media personality is undeniable, but does he really make $8 million a year and has Joe Scarborough’s net worth really ballooned to $30 million? We uncover the facts below. How Much Does Joe Scarborough Make? After graduating Pensacola Catholic High School in Florida, Scarborough attended the University of Alabama. In 1985, he earned a Bachelor of Arts in Political Science, and he was heavily involved in on-campus politics and activism, which included running for office. After graduating UA, Scarborough attended the University of Florida College of Law, and earned his Juris Doctor in 1990. During this time, he also taught high school and coached football, and in 2018, he was welcomed to back to UF Law to serve as the speaker for that year’s graduation. He’s also given the commencement speech at Eureka. Joe Scarborough would later become a visiting fellow at the Harvard Institute of Politics. His current wife, Mika, is an Institute of Politics fellow as well, and together, they have been involved in a number of notable Institute of Politics events. Scarborough passed the bar exam and was admitted to The Florida Bar in 1991. He didn’t begin practicing law until 1993 and initially served as a defense attorney. His most prominent client was Michael F. Griffin, who had killed a doctor for performing abortions. Although Scarborough would eventually refer Griffin, he continued to assist his family voluntarily and without payment. The prospect of sitting in a capital trial did not appeal to Joe, and this is the period where he realized that politics, not law, was his path. In late 1993, he became deeply involved in a petition drive to prevent a 65% hike in local property taxes, and this would stoke the fire of his political career. The following year in 1994, Scarborough would run and win the seat for Florida’s 1st congressional district. There was some good luck involved in that an eight-term Democrat had retired and a Republican wave was sweeping not only the Florida Panhandle but also much of the United States. Scarborough’s success was his own however. Although he had won the first time with 61 percent of the vote, he was re-elected with 72 percent of the vote. His position became so entrenched by this point that he only faced write-in opposition for the 1998 and 2000 elections. He signed the Contract with America, and he served as the Civil Service Committee chairman in 1998. Other committees that he served on included Armed Services, Education, Government Reform and Judiciary. After leaving Congress, Scarborough didn’t go into television immediately. Instead, he served as an environmental lawyer for the Levin Papantonio Law Firm and practiced law with Beggs and Lane. While still serving in Congress, Scarborough founded The Florida Sun in 1999. This was a free newspaper geared toward the Pensacola area, and it would eventually merge and become known as the Independent News in 2001. This paper opened the door for his post-politics career in media. MSNBC would eventually sign him for “Scarborough Country,” a 60-minute prime-time show in which he provided political opinions and analysis. While Scarborough’s time as a lawyer and a congressman, as well as the books he’s written, isn’t an insignificant component of his net worth, there’s little doubt that his time as a TV host—and in particular as a host of “Morning Joe”—has had the greatest effect on what he earns annually. Joe Scarborough is estimated to have a net worth of approximately $30 million and earn $8 million annually. A big component of that success is “Morning Joe,” which is a morning news and talk show that was launched in 2007. The show is produced by NBC News for MSNBC, its cable news channel. The show employs a panel format with Joe Scarborough and co-hosts Mika Brzezinski and Willie Geist. It began as a temporary solution when “Imus in the Morning” was canceled and was produced in New Jersey, but the show experienced immediate success and soon moved to New York as an ongoing show. Prior to “Morning Joe” was “Scarborough Country,” and while this earlier show certainly didn’t contribute as much to Scarborough’s wealth directly, it opened the door for that success. He was considered for “Morning Joe” not just for his knowledge and experience but also the presence he had on television. “Scarborough Country” debuted in 2003, and over the course of its run, it averaged about 30,000 viewers a night. Despite being very conservative, he demonstrated a willingness to be highly critical of other conservatives—including former President George W. Bush—and that arguably increased his appeal. However, the show was at times criticized for tackling tabloid stories that were deemed beneath it. Scarborough published his first book in 2005 and has published three books in total. As a former Republican congressman, Scarborough provides an insider’s insight, and while his books haven’t been best-sellers, they have sold quite well and contributed greatly to his overall wealth. The book itself is a memoir and also a political treatise. Scarborough believed fully in the Contract with America, but he asserts here that it’s a contract not being honored by those who offered it. Critics praise Scarborough for being an independent thinker and a straight talker and for not pulling any punches. He discusses his own party with the same fierceness he does the other, which suggests that there’s little difference between them behind the scenes and pulls the curtain back on government spending. Published in 2010—five years after his first book—”The Last Best Hope: Restoring Conservatism and America’s Promise” has been called groundbreaking for not just its insight into modern conservatism but for providing a path forward. While it may be easy to criticize reactionary and sentimental behavior, it’s much more difficult to offer alternatives that are practical and align with the spirit of the movement. The book explores in great detail how conservatism has moved beyond a core set of principles to a series of stringent ideologies. Scarborough offers common-sense approaches to foreign affairs, economic policies, the environment, social issues and more from a refreshing conservative perspective. Similar to his last book, this title explores how Republican failures are largely self-inflicted. The party seized a great opportunity with the Contract with America but did little with it and has allowed ideology to stand in the way of practical solutions. This book differs from the previous one in that it looks to the past. It discusses how Eisenhower refused to let perfection “be the enemy of the good” and how Reagan employed principled pragmatism. Perhaps surprisingly, “The Right Path” is a largely optimistic book that shows a path forward not from the author’s own perspective—as he had previously—but by examining Republican history. The net worth of Joe Scarborough, which is estimated at over $30 million and may be considerably higher, has accumulated from multiple sources. While his time in Congress and as a TV host is often a focal point when it comes to his net worth, his earnings as a lawyer and as an author should not be overlooked. Scarborough served in the U.S. House of Representatives from January 3, 1995, to September 3, 2001. He made approximately $1 million in salary as representative during this time, and his average annual salary was about $137,000. During his time as a congressman, Scarborough would have been limited to earning 15 percent in excess of his annual salary. In his post-congressional career, Scarborough has earned money as an environmental lawyer and in other legal endeavors. He has earned profit from his three books, his short-lived radio show and “Scarborough Country,” which ran for more than four years from 2003 to 2007. During his 2013 divorce, it was revealed that he was earning about $99,000 a week for the show. Although the details of his current contract are private, estimates put it at about $8 million annually. That amounts to about $154,000 a week or about one-and-a-half times what he was earning just five years ago. Scarborough married his first wife, Melanie Hinton, in 1986. They had two sons together before divorcing in 1999. His son, born in 1991, has Asperger’s syndrome, and Scarborough has expressed concerns that the disorder may have been the result of vaccine damage. In 2001, Scarborough married Susan Warren, his second wife. Warren had served as an aide for then-Governor Jeb Bush as well as a congressional committee staffer. Scarborough and Warren had two children together—a daughter and a son—and were divorced in 2013. 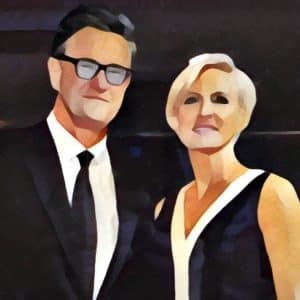 Joe Scarborough married his third wife, Mika Brzezinski, in 2018. Mika is an author, political commentator and talk show host. She has served as a CBS News correspondent, and she has co-hosted “Morning Joe,” a weekday morning show, with Willie Geist and Joe Scarborough since 2007.